Cats play-bite for many reasons; changing how you play and react can stop the behavior. Hands, fingers, and feet are not toys. 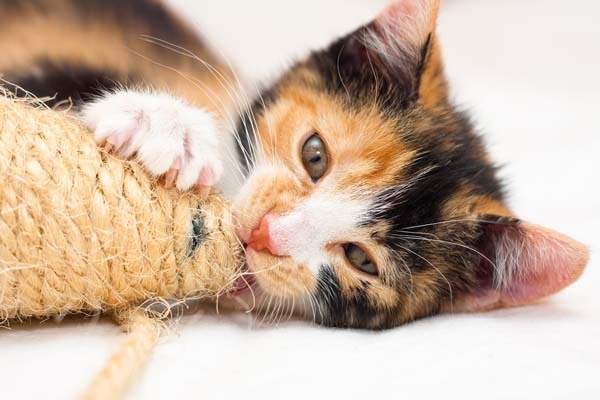 Although kittens generally are more guilty of chomping down on people’s extremities while playing, cats of any age can play-bite. You recognize these kitties — they might grab your arm with their front paws while you’re tickling their tummies. They also pounce and bite your hands and fingers as you wiggle them. Play-biters can be opportunists — launching themselves at extremities within easy reach. Others are easily overstimulated, biting during rambunctious play sessions. The painful behavior might not be limited to playtime. Some rowdy cats will attack their people’s legs and feet while the humans are soundly sleeping. Many of these cats bite because of how people play with them. Humans use hands and fingers instead of toys, encouraging the kitties to grab and bite. From the cats’ point of view, this is how they’re supposed to play. Although it might be fun to play with kittens using hands, as the youngster ages, biting often becomes a problem. Some play-biters have been separated from their moms and siblings at too young an age. Play is a very important social teaching tool. Kittens learn boundaries and bite inhibition by playing with their littermates. 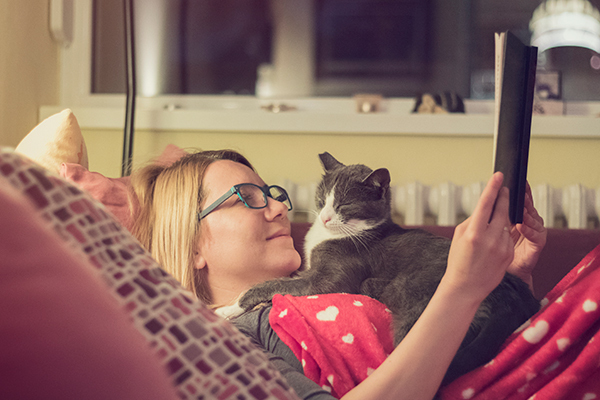 Kitties who are encouraged to help make the beds and play under the sheets and blankets often enjoy playing night games — attacking their people’s legs and feet while they sleep. 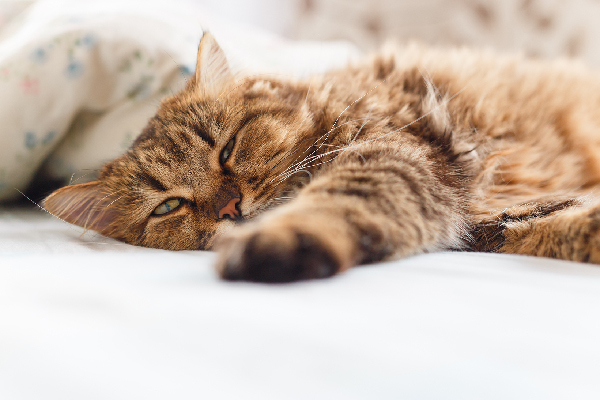 Although it might seem cute to wiggle hands under the sheets and blankets while playing, it’s not so fun when those same kitties pounce on their sleeping owners. Although it’s difficult, don’t pull away while being bitten. Cats are hard-wired to chomp down on prey that is trying to escape. Try to relax the extremity the cat is biting and freeze it in position. Because you aren’t acting like prey, cats will usually release their hold. Kittens need to learn that hands and fingers are not toys. Play with youngsters using safe toys that can’t be chewed apart and ingested. Fishing pole toys are ideal because they put distance between your hands and the kitten. Always play with cats of all ages using toys, not body parts. Hands are dispatchers of affection and love, not roughhousing and play. Give your little biter a time out. Time outs are easy to do and they don’t last long. When your kitty is biting or overstimulated immediately stop interacting with her. Turn around, leave the room, or turn your back to her. Don’t yell, call her name or interact with her in any way. Time outs for play biting are short — lasting one to five seconds. After the kitty has calmed down, you can start paying attention to her. It doesn’t take many time outs to stop the behavior — the cat quickly learns that when she bites, her favorite playmate disappears. In addition to time outs, make sure your little biter has appropriate toys to chomp and bat around. Don’t encourage your cat to help you make the bed. Resist the urge to play under the sheets and blankets with her. You might have to temporarily remove her from the bedroom while making the bed. When possible, allow kittens to stay with their siblings until they are 12 weeks old so that they learn important social skills such as the limits of rough play, boundaries, and bite inhibition. Don’t punish or yell at cats when they bite while playing. Punishment can cause cats to become fearful, stressed and afraid of people. Although play biting can be stopped, the hardest part is changing how people play with their cats. Everyone in the household needs to modify their own behavior, learning to play in ways that don’t encourage biting. Got a cat behavior question for Marilyn? Ask our behaviorist in the comments below and you might be featured in an upcoming column. 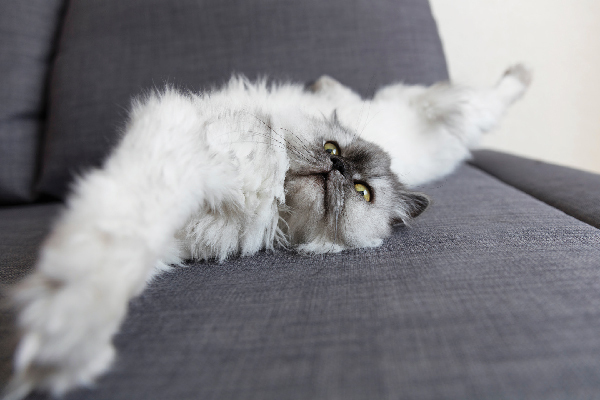 If you suspect a behavioral problem, always rule out any possible medical issues that might be causing the behavior by first having your cat examined by a veterinarian. I gave my year old spayed cat a foot long fuzzy tube-toy that has a few feathers on one end. She played with it for a long time, chasing it, etc. but lately she is mating with it, holding one ends with her teeth, while straddling it and walking in circles, stopping at times to step side to side like she is mating it. Is she just conquering and dominating her prey? Should I allow this behavior, or throw the toy out? She was a wild kitten that showed up on my porch, at about 10 weeks old. I slowly tamed her and she is the perfect pet for me, and super attached. She was very scared of lots of things and people for quite a long time, and I figured had endured no telling how much trauma in her early days. Shes super smart, and communicative. Just unsure about this mating behavior.